Demaryius Thomas is currently the longest player in the Denver Bronco team. The Wide Receiver who is arguably one of the best in the NFL began his journey into the National Football League in 2010 after the Broncos selected him as the 22nd overall pick in the first round of the 2010 NFL Draft. Before his professional career with the NBA, Thomas played college football at Georgia Tech. Read on to learn more about the WR, his biography and every other fact you need to know. 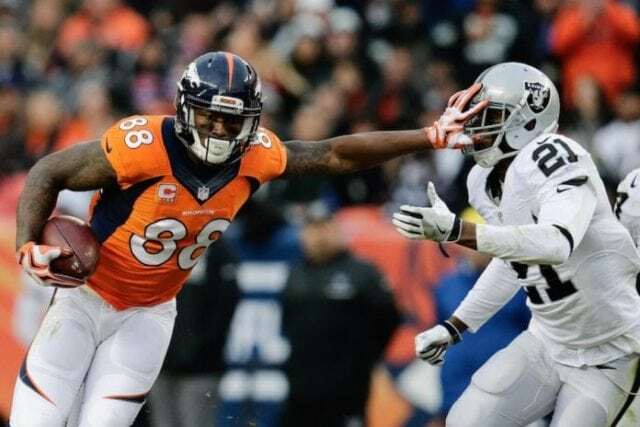 He was born as Demaryius Antwon Thomas on the Christmas day of 1987 (December 25, 1987) in Montrose, Georgia to Bobby Thomas and Katina Smith. His parents were never married. Bobby and Smith met as teenagers and began dating, Katina became pregnant in the process and had Thomas at the age of fifteen. Despite not being married and Bobby never being around due to his work as a military officer, the pair shared custody of their son until Katina was arrested and jailed for life. 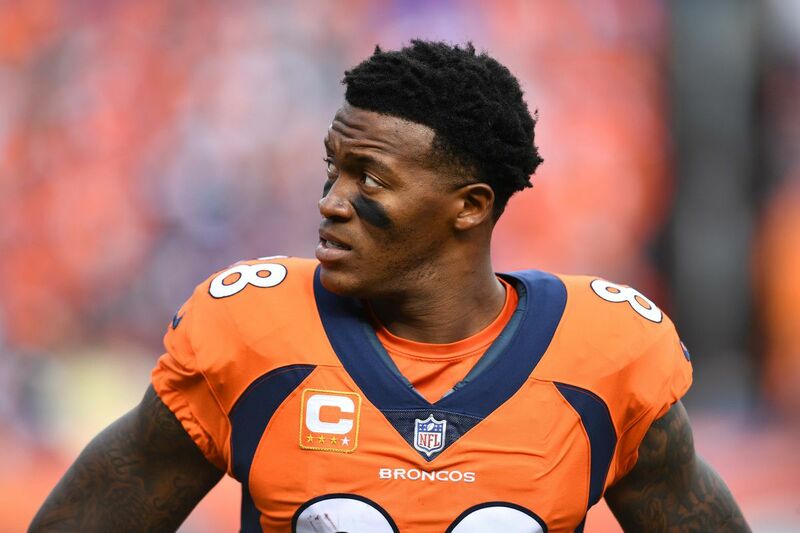 Demaryius was barely twelve years old when the police invaded the house where he lived with his mom and grandmother and took them away on the count of Narcotics Trafficking. The two were later sentenced to twenty years in prison and life in imprisonment for crack distribution. With his mom and grandmother in prison and his dad away in the Army, Demaryius Thomas was raised by his aunt and uncle. In July 2015, after almost fifteen years of being locked up, Katina became a free woman again, she was one of the forty-six prisoners whose sentences were commuted by former President Barack Obama. The following year, his grandmother was also released under the same national pardon. Thomas has two younger sisters; Tonecia and Tyeshia. He attended West Laurens High School, Dexter, Georgia, where he got involved in three different games (football, basketball and track) and was very good in all but took a special interest in football and was coached by Andrew Slome. In 2004, he was named all-region and all-Heart of Georgia player as a junior after recording thirty-two receptions for three hundred and thirty yards with 3 touchdowns. Again as a senior, he was named an all-region and all-Heart of Georgia, Class AA all-state first team and PrepStar by the Atlanta Journal-Constitution after making eight-two receptions for 1,234 yards and 10 touchdowns that season. While Scout.com ranked him the 22nd prospect in Georgia, Rivals.com put him 34th on their own list. In that same year, Thomas received scholarship offers from Georgia Tech and Duke but chose Georgia Tech over Duke. He was redshirted for the 2006 season. The next season, he played in all the team’s thirteen games, starting ten. He recorded thirty-five for five hundred and fifty-eight yards and became the second man on the team to achieve such a feat after Greg Smith. Demaryius Thomas’ prowess would see him named to the All-Atlantic Coast Conference (ACC) first team as well getting an All-America honorable mention by The Sporting News as a freshman. During his junior season, he had a season breakthrough of forty-eight receptions for 1,154 yards and 8 touchdowns, this record earned him First-team All-ACC honors. After this season, he declared for the NFL Draft ending his collegiate career with a total of one hundred and twenty catches for 2,339 yards and fourteen touchdowns. Despite missing out in the combine drills due to a broken foot, Thomas still came second with thirty-four points on the Wonderlic test he was just behind Eric Decker, who had the highest among WR at the combine with forty-three points. He was selected 22nd overall pick in the first round of the 2010 NFL Draft by the Denver Broncos. During his first game with the team, he recorded 8 receptions for ninety-seven yards with one touchdown to become the 9th NFL player since 1970 to record at least 8 catches in his first game. He also became the 2nd rookie in the history of the franchise to make such record. His rookie season was however plagued by injuries; ranging from an ankle injury to a forearm injury and then a concussion, thus, he ended the season appearing in only ten games with twenty-two receptions for 283 yards and 2 touchdowns. Demaryius Thomas has remained with the Broncos till date and he is currently the longest player in the team. There are conflicting figures as to how much the NFL Wide receiver earns as salary and what he is actually worth. Following his latest contract extension with the Broncos worth $70 million, the Wide Receiver’s base salary as at 2018 is $12.03 million but some sources say his base salary is $3.5 million. His net worth net worth currently stands at $9.5 million. He is reportedly the tenth richest Wide Reciever in the league at the moment, as well as the 47th richest NFL player. The NFL star stands at a height of 6’3″ (1,91 m) and weighs 107 kg that is 236 pounds. His other body stats have not been confirmed.